When Scott Goldbaum, formally of Wise Cub, called on his old friends Nick Chamian and Mike Musselman to start a new music project, the decision was organic. Later, the team paired with Molly Rogers to complete the band now known as Forebear. It was not long after forming that Forebear caught the attention of Scott Gordon, a producer and engineer who had previously worked with artists such as Alanis Morissette and Ringo Star. 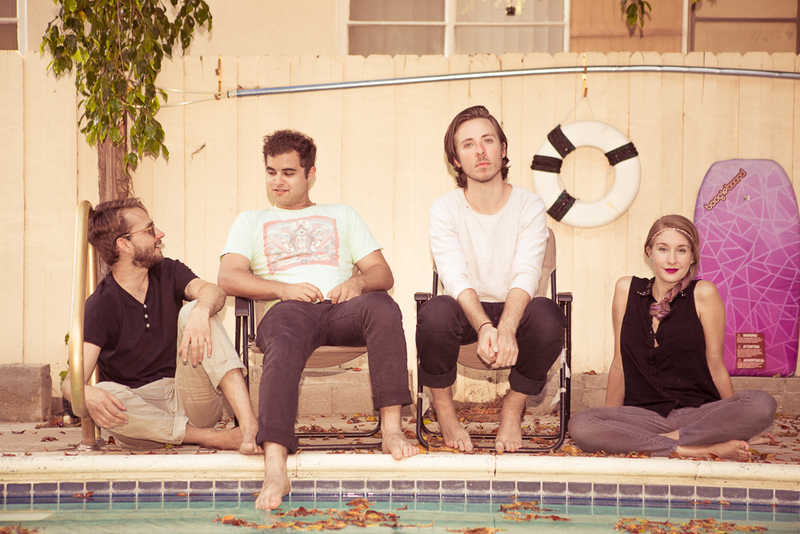 Forebear’s self-titled debut EP was released last November. Scott and Molly of the band took the time to fill me in on some of their future plans! How did Forebear come about? Scott Goldbaum – In 2011, I began touring as a solo artist under the moniker Wise Cub. In the efforts to produce a full band for a larger scale live performance, I reached out to friends and colleagues in the industry who would be up for supporting his songs on stage. It took a while before we all come together, but as a result and with the mutual history of playing in a band with Nick Chamian (bass) and Mike Musselman (drums) when we were all growing up in the San Fernando valley, it just made sense for all of us to come together, not to mention the immediate connection we had with Molly Rogers (viola/keys/vocals) as a person and as a musician. We all realized pretty quickly that we were on to something special and that had evolved into a much different sound that the previously written work called for. So we decided to embrace the collective and along with our brand new sound came a brand new name, Forebear. The music you create has been described as “taking listeners on a surreal experience.” Can you talk a little bit about your sound and how you hope it influences your listeners? Molly Rogers – If anything other than simply enjoying it, we think our songs have plenty of emotion to them. Scott Goldbaum – Often I’ve noticed people denying themselves the time to struggle with their feelings or to even be in the moment that frees themselves from the constant mental distractions. Lyrically, I hope that people would find a relationship between the singer and his or her own personal grappling of the range of emotions supported by music that only furthers those stories. The surreal aspect of it all probably stems from a lot of very “real” feelings that we are all encouraging the listener to get lost in. I think our music tends to offer the same effect as if the lyrics would be if simply read on paper. Whether it is being fired upon returning to work, expressing violent urges, struggling between the weight of an interpersonal loss and a foreseen global crisis, there’s something for anyone who feels the disparity between what is and what ought to be within their own mind. It is interesting to see an indie rock band incorporate a classical instrument like the viola. Was this a natural integration? How do you feel the viola adds to the music you produce? Scott Goldbaum – It was incredibly natural in the sense that Molly was playing the violin within Wise Cub prior to us announcing the name change to Forebear. I still have a video on my phone from the first time Molly and I ever sat down in her apartment and began integrating the viola over the violin on an old Wise Cub song called “Comet.” The band has always been huge fans the way that strings were used in bands like Cursive and within Damien Rice’s ensemble, and Molly brought in her own classical upbringing and score influences (John Williams, James Newton-Howard, Dmitri Shostakovich, etc.) and translates it into something that somehow worked for the music we were all creating. Originally, Molly was playing the violin, which then evolved to her choice of playing viola because of the deeper, richer sound of the instrument which helped pull things together more so than the sound of the violin. As soon as we first heard the change, we thought the viola was the perfect addition of the instrumental vehicle to solicit emotion from the listener, especially driven behind Molly’s innate virtuosic instincts and musical tastes. Aside from you being a very talented band, you are all very skilled as individuals, having worked with musicians such as Feist and Bastille. Do you feel you each bring musical elements to the group or do you find you think as a unified whole? Molly Rogers – A new song could originate in a number of ways between the four of us. Due to how different albeit strangely complimentary all of our musical upbringings have been, our sound is the product of four individuals who aren’t afraid to offer and blend differing musical ideas. Individually, we’re grateful to be working together where we all innately understand how different we each are as musician in both tastes and experience, and yet we trust each other enough to let it meld together to create the music that we do. Do you have a favorite song you have written? What about a favorite song in general? Scott Goldbaum – Starting February, we are going on a Californian tour with our good friends and phenomenal performs, Figs Vision. You can keep up to date with where we’ll be playing either on our website (www.forebear.la) or on Facebook or Twitter. In the next couple of weeks, we are releasing a new track that we are really excited about and plans for releasing our forth-coming EP early summer. This entry was posted in Uncategorized and tagged Band, Forebear, Interview, Music, New EP, Q&A. Bookmark the permalink.